But Ghana was different. 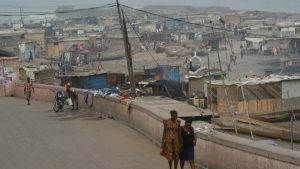 There was no question whatsoever that this was Africa. After passing through customs I met up with Charles Dogboe, uncle of the main even fighter and right hand man to promoter and trainer Paul Dogboe. It was late and I was hungry…and we had a busy day tomorrow at the weigh-ins. 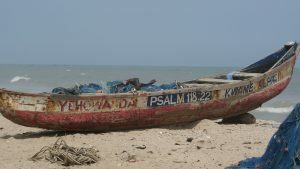 I hoped in his car and we made our way to my hotel: the Oceanic Resort in Accra. Although the Oceanic was a bit out of the way it made up for it in charm and the simple fact that it had a kickin’ pool and an amazing view of the ocean. It also had great service. 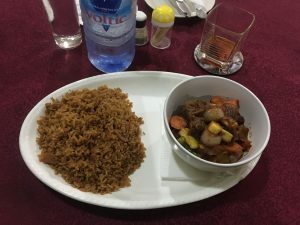 Although late at night they opened up the restaurant for me and cooked me up a traditional Ghanaian meal of jollof rice and goat stew. Well, I don’t use the phrase “Thai hot” anymore. No. 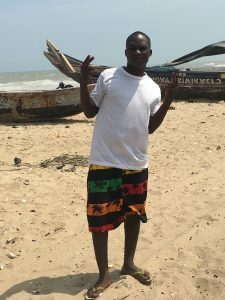 There is hot…and then there is Ghana hot. 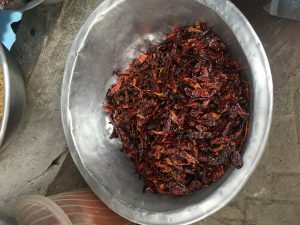 In one of Isaac Dogboe’s earlier fights in Ghana his opponent, an undefeated Ugandan named Edward Kekembo, blamed his loss to Isaac in Accra on the “peppers” of Ghana, citing the spicy food. It earned a round of chuckles with a few of my boxing associates and myself, as we ranked it up there with “I was poisoned by my hairspray” as one of the more interesting excuses for a loss in the boxing ring. But at that moment I have to admit, the theory held a little bit of water. This rice had a serious kick to it. But damn if it wasn’t the best spicy rice I ever had…and I have to say, we Koreans know spicy rice. I felt like a French wine snob who just tasted his first Malbec from Argentina…my world view had forever changed as I tasted jollif for the first time. The following morning I discovered that several of the referees and the main event fighter, Javier Chacon, were staying in the same hotel. Charles picked us up where we made our way to the luxurious Kempinski Hotel, where the weigh in was set to take place. 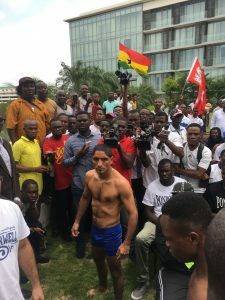 There were quite a few people with both the promotion and with the World Boxing Organization (WBO) who were staying there and I would become a frequent visitor of the Kempinski Hotel in Accra over the next few days…and all I can say is wow. I was able to use their gym, which was one of the better ones I’ve seen in a hotel, and their pool was absolutely amazing. 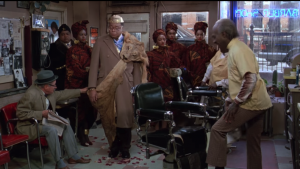 I won’t lie, everything there sort of blew me away…I felt like that old white guy from the barber shop in Coming To America admiring King Jaffe Joffer’s shawl. The weigh-in had an energy that was refreshing for those of us in boxing. 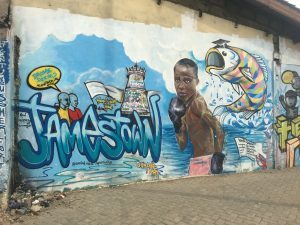 It felt like the nation (and the nation’s media) wanted to be part of the Issac Dogboe story early on and I couldn’t help but feel a little bad. Those of us in the States only jumped on bandwagons long after the train had left the station. Covering fights in Michigan in the early 2000s I knew that most of my fellow boxing writers tended to watch with curious interest in the rise of Floyd Mayweather. He was a champion but we were waiting to see just how big he would become. When he fought Phillip Ndou in Grand Rapids back in 2003 we were interested….but we weren’t passionate. In Ghana they had an young future world champion and with it they brought an energy that we didn’t. It wasn’t an improper bias they had, no, it was something else. A determination to absorb everything that would make this story of Isaac Dogboe complete, regardless of how it ends. 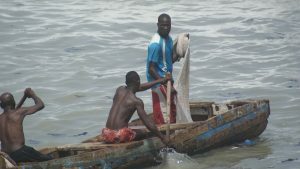 The Ghanaian sports writers were invested in the story in a way that really impressed me. 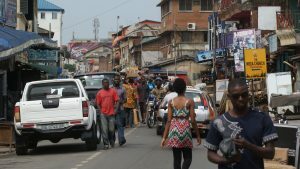 But alas, this isn’t a boxing story, it is a story of Accra. I finished covering the weigh-in and in the process got what may be the best boxing photo I ever took, of a stoic Javier Chacon in enemy territory as a nation looked on. By the end of the weigh in I discovered I would be in for a rare treat. 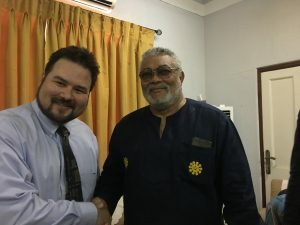 The fighters, media, and boxing officials would be heading to the home of former Ghanaian president Jerry Rawlings, one of the most respected former leaders in all of Africa and a well known boxing fan. Rawlings was a former flight lieutenant of the Ghanaian Air Force who seized power in a coup in 1979 and proceeded to purge (i.e. execute) two former presidents (i.e. generals who also seized power by way of a coup) by way of firing squad. Rawlings also purged other leaders of the Supreme Military Council (the junta that ruled Ghana from 1975-1979). 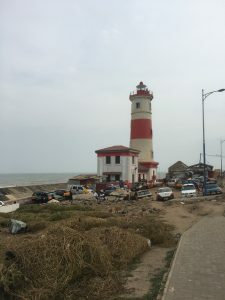 It was, as Wikipedia described, one of the bloodiest incidents in Ghana’s history. But from that bloody beginning was something the world was not expecting. Rawlings, many assumed, would simply be another Mobutu like dictator. A military man who would rule with brutality, force, and possibly a cult of personality. But Rawlings would ultimately surprise many when he built the foundation of a true democracy in Ghana. 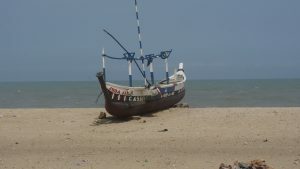 Many remained skeptical when he formed a “National Commission on Democracy” and some opposition leaders complained loudly when he ran, and won, in the 1992 Ghanaian presidential election. Rawlings would win re-election in 1996 but it wasn’t what transpired from 1992-2000 there that cemented his status as a beloved former president. It was what happened in 2001. Rawlings could have easily “suggested” that the constitution (that he pushed for) be amended to allow him to run for a third term. He refused. And when his vice-president lost the 2000 election to opposition leader John Kufuor Rawlings could have somehow stepped in and refuse to recognize the legitimacy of Kufuor’s victory. Rawlings didn’t do that either. No, instead Rawlings stepped down, and that simple act planted a seed of democracy that is still growing in Ghana. And I was about to meet the man who emerged as not just the father of democracy in Ghana, but as one of the father’s of democracy in Africa. Rawlings came out and met with the fighters, referee Tony Weeks, and several WBO officials before I was introduced to him. I won’t lie, I was a bit star struck. 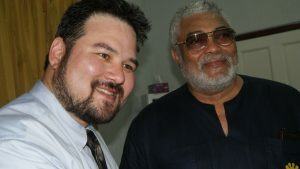 I’ve met a lot of fighters from Canelo Alvarez to Manny Pacquiao…but Jerry Rawlings was the first man who had me star struck. 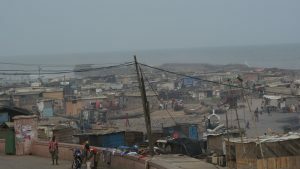 After we left I realized I had the entire day off and I decided to use it to explore Accra. 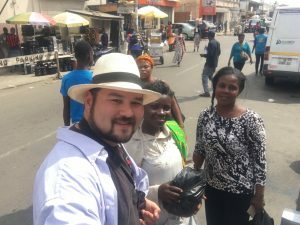 I started to wander down the streets of Accra, where I emerged as something of a minor celebrity. 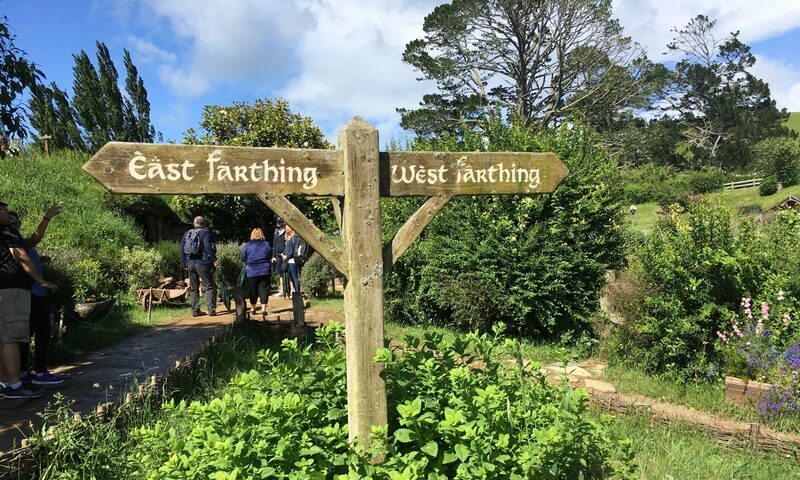 I wasn’t in the tourist section…I can’t even say where I was. All I know is it teemed with life. As I walked down the beach I was greeted by, well, by everyone. From the kids waiting for the school bus to the fishermen wondering where I was going and what I was doing. And of course by the hucksters and hustlers who tried to sell me whatever it was I was shopping for. 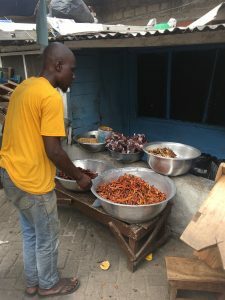 I soon made my way to what I was told was one of the more bustling marketplaces in Ghana, and although I didn’t stand out as much as I did on the way down, I wasn’t exactly blending in. 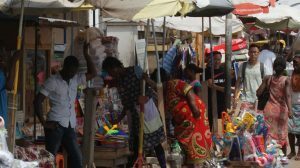 Gringos tend to be seen as a profitable mark in most marketplaces the world over and I got the sense Ghana was no exception. But with that being said, after buying a homemade Africa dress for a reasonable $7 I assumed that if I was being ripped off I was still doing OK. 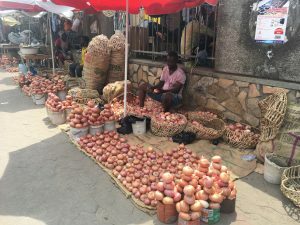 But as much as I enjoyed window shopping, there was something I really was interested and that was the street food in Accra. 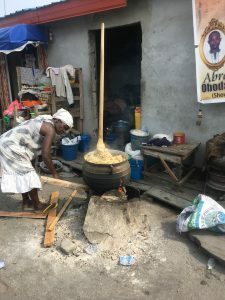 I knew fufu was high on my list and I did get the opportunity to see it made by hand, well, see it getting made by hand. I was told it was a long and difficult process that required endurance and dedication. But that the reward was very much worth it. but I wasn’t really ready to sit down and experience it just yet. 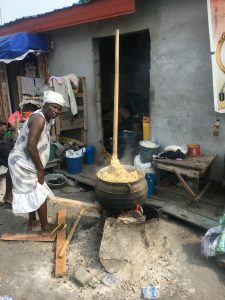 No, watching fufu getting made was like watching a carpenter make a table. You had to be ready to appreciate the process…and the labor of love that went into it. 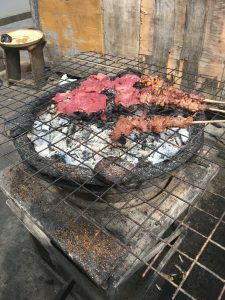 Instead I decided to get some grilled meat on a stick from a street vendor. 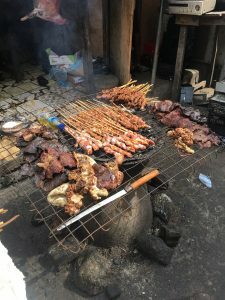 After all, I seldom am disappointed from grilled meat on a stick wherever I am, and I assumed Accra would be no exception. There were several choices and most look familiar…so naturally I picked the one that didn’t. 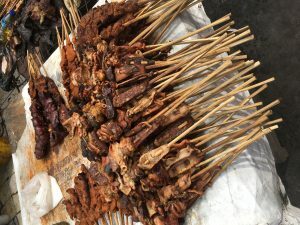 But as I bit into my skewer I quickly came to a disturbing conclusion: it tasted like someone emptied an ashtray in a bowl of cottage cheese…and whatever I was eating was the intestines of some small mammal. Yeah, needless to say I don’t want to think about it too much. 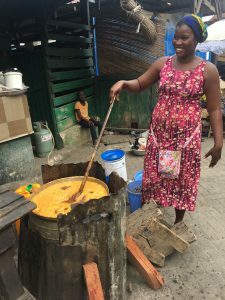 As I made my way into what I quickly concluded was something of a “food ally” of Accra I soon discovered a woman and man running a small homemade stand in a particularly tight alleyway. I was a little gun-shy over trying something new again but this looked different…it appeared to be a spicy fish stew…and there was no way the Korean in me was about to pass up on some spicy fish stew. “What is this called?” I asked the man. “Shito.” he replied with a smile, one that gave me the sense that he was messing with me. After all, the first syllable of that word didn’t instill me with confidence, especially considering I could still taste the rat intestine in my mouth. I decided to take him up on his offer. 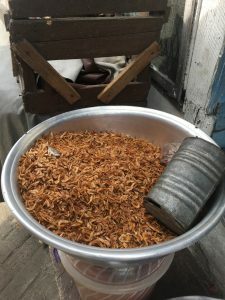 Yeah, I was nervous, but I wasn’t about to let one grilled rat ruin my favorite part of travelling: the experience of trying something completely out of my comfort zone. And I am glad I did…because shito is the bomb. 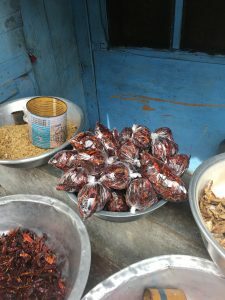 I bought a bottle for the road and then sat down and chatted for about half an hour with the shito salesman and his wife. As I headed back I couldn’t help but notice that Ghana was above all a boxing country. 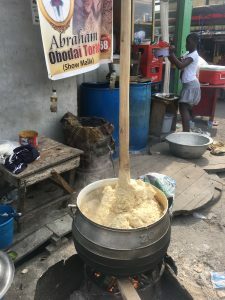 Now don’t get me wrong, Ghana is a football country first and foremost…but from the former president to the shito salesman I got the sense that every Ghanaian was more than just a casual fan of the Sweet Science. 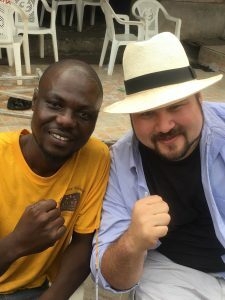 I made a few more stops on my way to my hotel…tonight would be the fight and I wouldn’t have time to spend in Accra tomorrow, where I had hitched a ride with Tony Weeks to visit the Cape Coast Castle. 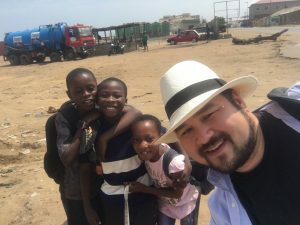 So this would be it…my time in Accra. 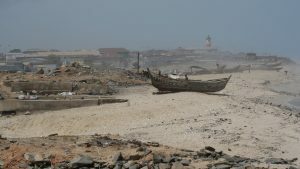 As I made my way back to the coast I noticed a small beach front village near the lighthouse and wanted very much to explore it. But I also recognized I was out of time. 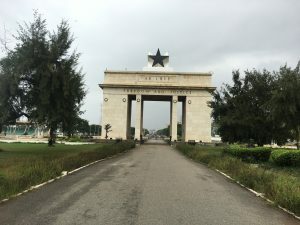 Before catching my flight to Ethiopia I was able to squeeze in one more stop thanks to Charles Dogboe: the Independence Arch. 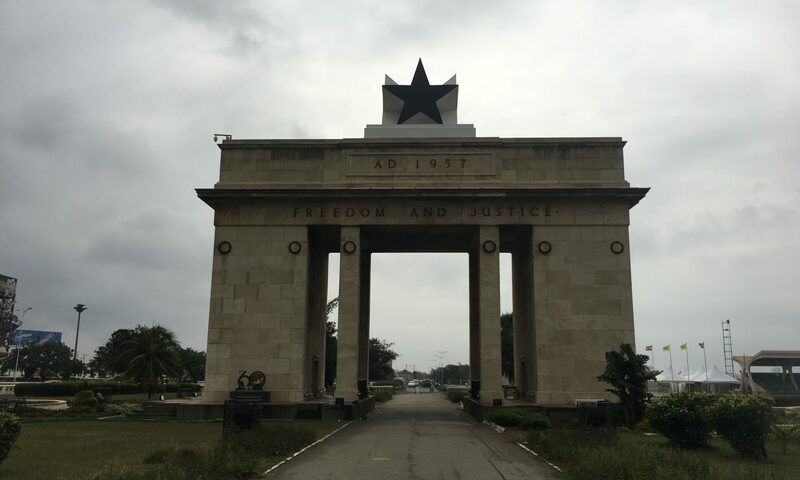 One of Ghana’s most famous monuments I had seen it almost every day in Accra…but I hadn’t had a chance to see it up close. 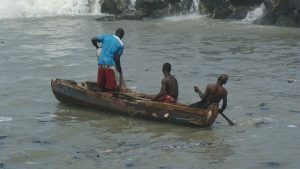 Charles stopped long enough to allow me to explore…and yeah I suppose I can check that one off the list of things I saw in Ghana. But deep down I know I’ll have to go back. 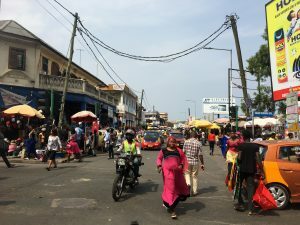 I only scratched the surface of Accra…but it still left a mark. 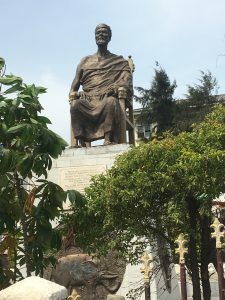 There is still so much more to see in Accra, and Ghana, and someday soon I plan to check a few more of those places off my list.